Most chickens raised for meat in the US are suffering on inhumane, unsanitary factory farms. Pledge not to purchase chicken from the worst factory farming conditions for 30 days. 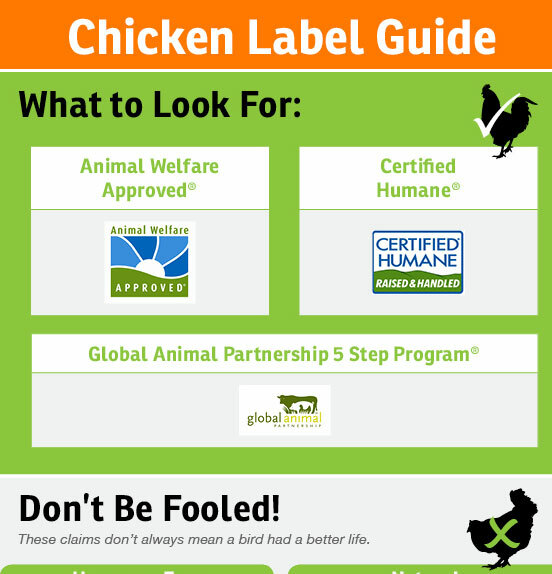 If you buy chicken, only purchase products bearing higher-welfare certifications. Together we can make a more humane world. The more people we have, the better chance we have of making an impact. Help us reach 50K challenge takers! Most of the chickens ending on people’s plates lived in inhumane, unhealthy factory-like facilities. Watch our video to learn how it got this bad and what you can do to stop this cruelty. Pledge to change your chicken today, and don’t forget to share the video with your friends! Continuous access to pasture or range. No feedlots. Cage confinement, hormones and subtherapeutic antibiotics prohibited. Standards extend to breeding animals, transport and slaughter. Continuous outdoor access for ruminants. Cage confinement, hormones and subtherapeutic antibiotics prohibited. Minimum space allowance and bedding required for indoor environments. Step 2: indoor space and enrichment requirements. Step 3: outdoor access. Step 4: access to pasture. Step 5: full pasture environment. Step 5+: slaughter on farm. Auditors visit farms, but indoor conditions vary widely and can be crowded and without enrichment, fresh air or sunlight. Birds have “outdoor” access, though amount, duration and quality of space is undefined and can vary widely. An unregulated term without standards. As defined by USDA, this term only refers to how meat is processed after slaughter, not how an animal was raised. A meaningless, misleading claim for meat chickens because, unlike egg-laying hens, they are never raised in cages. Birds have access to outdoors, though amount, duration and quality of space is undefined and can vary widely. Another misleading claim. It’s already illegal to feed hormones to chickens. Antibiotics are fed to animals on factory farms as a band aid fix for unhealthy living conditions. However, removing drugs does not alone make for a more humane system. Look instead for certifications that prohibit the misuse of antibiotics and require healthier environments. Share the challenge with friends! Consumer Reports looks at 23 different labels found on chicken packages and provides detailed information on what they require in terms of animal welfare, public health and sustainability. A deep investigation by PBS into the causes of antibiotic resistance and foodborne illnesses in chickens and why the government isn’t doing more to stop it. What Comes First, the Chicken or the Environment? John Oliver exposes how inhumane and unfair the chicken industry’s practices are- to farmers as well as chickens. This report from the ASPCA provides evidence that the chicken industry’s focus on genetic selection for fast growth and efficiency causes widespread suffering and may be putting consumers at risk. Over the last few decades, corporatized, industrialized agriculture has largely replaced America’s independent small farms—with catastrophic consequences for animals. While there is no strict definition, industrialized “factory farms” are characterized by extreme confinement of large numbers of animals with practices designed to maximize efficiency and profit, and little regard for animals’ well-being, sentience or natural behaviors. Factory farms often use animals bred to produce unnatural amounts of eggs, milk or meat, causing painful disorders and lameness. Mostly mechanized, there is little individualized attention, contributing to neglect of sick or suffering animals. These farms also frequently administer routine, low doses of antibiotics just to keep animals alive in unhealthy environments. Sadly, most of the more than 9 billion farm animals raised for food in this country now live in these kinds of industrialized facilities. While some welfare-certified farms are still factory-like in some ways, the certifications we point to signify meaningfully better welfare than standard industry products. Why is the ASPCA promoting this challenge? In the U.S., there are more chickens raised for meat than any other land animal raised for food. Nearly 9 billion chickens are slaughtered each year in the U.S. Most of those birds are raised in giant, crowded sheds and bred to grow unnaturally fast, with massive chests for breast meat. Unable to support this weight, many birds spend virtually their entire lives sitting in their own waste, their breasts and legs developing open sores. In addition to being inhumane, these practices can promote foodborne illnesses, and chicken now causes more outbreaks and hospitalizations than any other animal food. Through our Truth About Chicken campaign, the ASPCA has worked to educate Americans about chickens’ plight and call on the chicken industry to improve their lives. Over the last year, a few companies have begun acknowledging the need to address the welfare problems associated with fast growth of chickens. But most of the chicken in supermarkets still does not meet what we consider basic welfare standards (despite what some labels may claim). 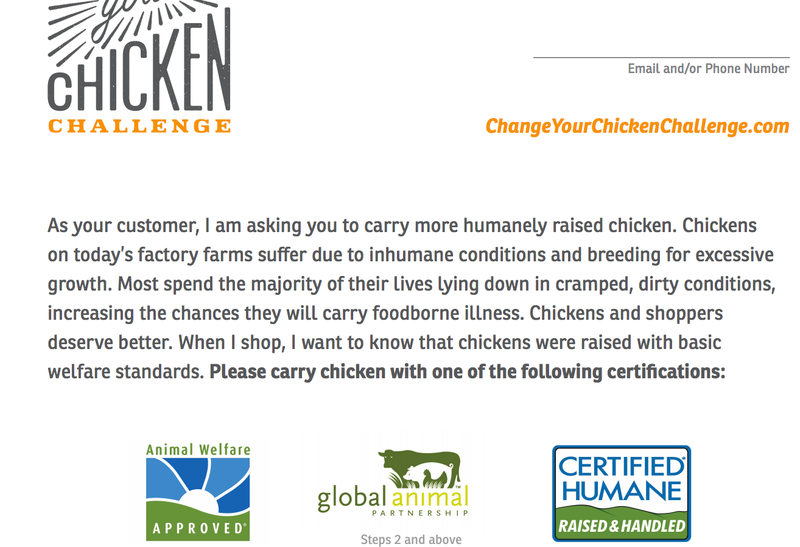 The Change Your Chicken challenge is about empowering consumers with the tools they need to find or demand meaningfully certified products. By shifting our buying habits for even 30 days, we send a clear message to the chicken industry that there is a growing movement demanding real change for billions of chickens. For more information on the welfare problems of industrialized poultry production, read our white paper. 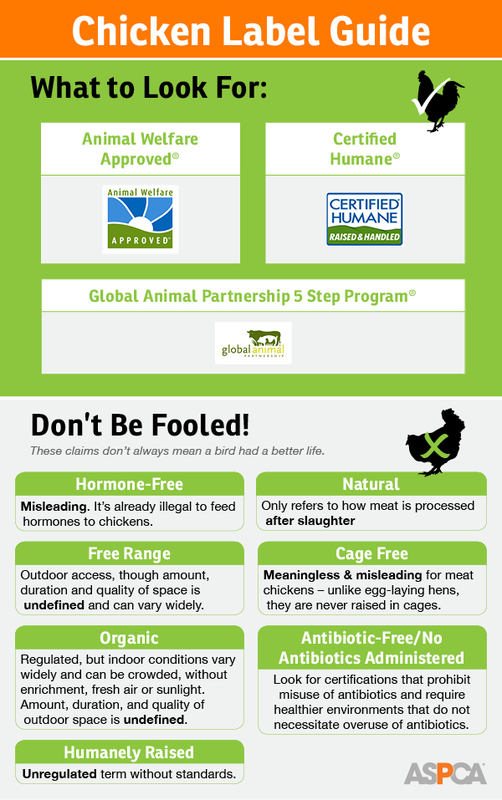 If you eat chicken products, challenge yourself to find brands that are certified by either Certified Humane, Animal Welfare Approved or Global Animal Partnership levels 2 and above. Once you’re signed up, we will email you helpful tips, resources and facts to support you through this 30 day challenge. Download and print this supermarket request card to hand to store managers when you can’t find higher-welfare certified products. Share this challenge with your friends and family. We want 50,000 Americans to take this challenge. That’s a call for change the chicken industry can’t ignore! What if I do not buy chicken meat? You have a critical role to play! By taking the pledge and sharing it widely, you add your strength to this movement and can help your friends and family realize that many products come from terrible factory farms that they would not consider humane. So challenge three people you know who do buy chicken to take the pledge. Certified Humane, Animal Welfare Approved and Global Animal Partnership (levels 2 and above) represent a range of higher-welfare practices, but all three certify that the chicken you’re buying was not subjected to the terrible crowding, filth, sickness and suffering found on the worst factory farms. All three certifications require on-farm audits, prohibit the use of antibiotics for growth promotion, set minimum space standards and require enriched environments for birds. 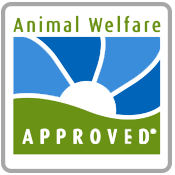 Animal Welfare Approved and Global Animal Partnership levels 5+ have the highest welfare standards, requiring pasture access and more balanced, slower-growing breeds. 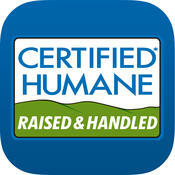 Visit their websites to see their full standards and find certified animal-based foods. What if I can’t find these products? What more can I do for farm animals? 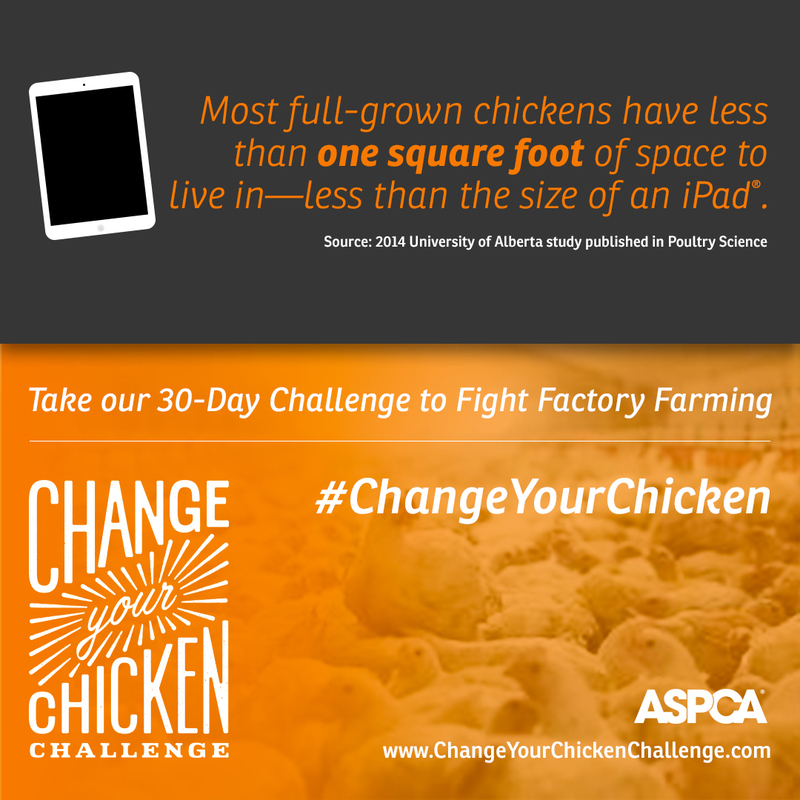 Share the Change Your Chicken Challenge with as many friends as you can! We’re just getting started. Learn more about how farm animals are raised and the few laws that govern their treatment. Download our meat, eggs and dairy label guide to avoid factory farmed animal products of all kinds and seek out trustworthy higher-welfare certifications whenever possible. Sign up for our advocacy brigade to be the first to know when we need your help contacting state representatives to push for laws that protect farm animals. © 2015 ASPCA. All rights reserved. The ASPCA is a 501(c)(3) not-for-profit organization.